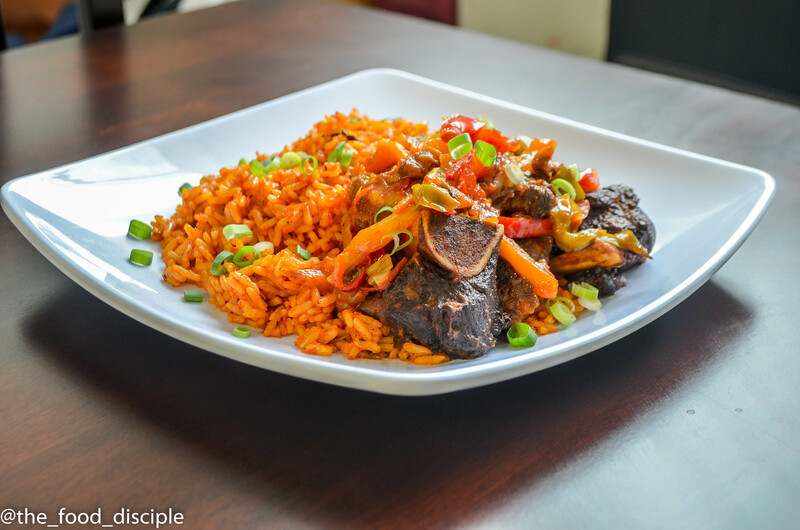 In honor of world Jollof Rice day, here is one of my recipe for making Jollof rice and peppered beef to accompany this deliciousness. 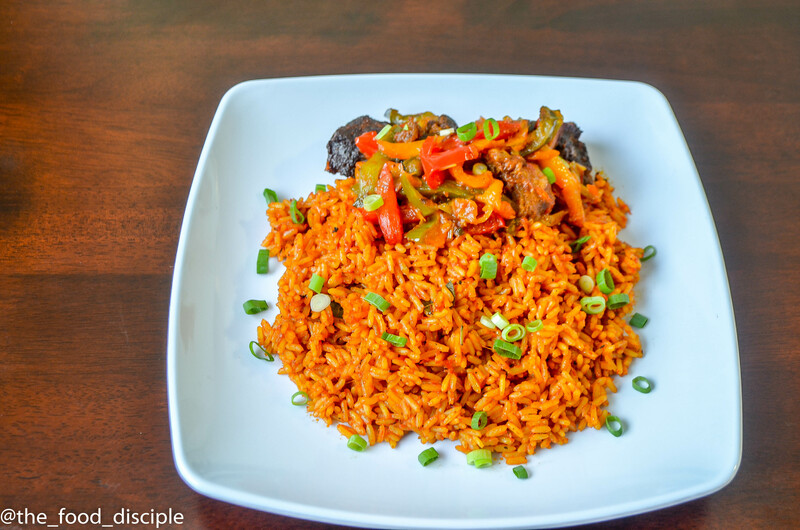 Jollof rice is simply the best kind of rice, and it is loved by everyone across West Africa. 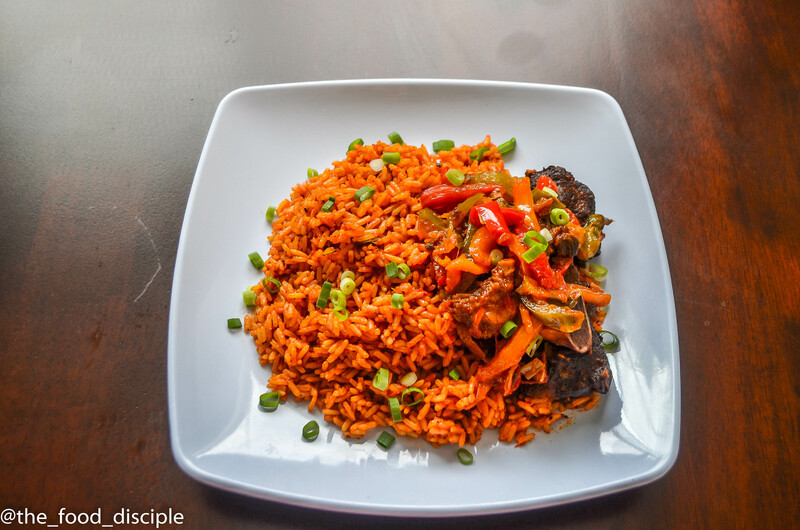 Jollof rice does not need any introduction or explanation of its greatness so am just going to go ahead and bless you all with my recipe. Step 1 Blend 4 fresh tomatoes, 6 red shepherd pepper, 4 scotch bonnet pepper, 1 red onion, 3 cloves of garlic, fresh ginger and 2 small tomato paste. Do not add any water, let the juice from the fresh tomato serve as the water. Blend until smooth and set aside. Step 3 add this mixture into beef with 2 cups of water. Add 2-3 seasoning cubes, 1 tbsp of curry, 1 tbsp of Italian Seasoning cube, 1 tsp of granulated garlic and salt. Cook meat on medium high heat until tender. Add salt according to preference. Step 4 Once beef is tender, grill or fry your beef until it achieves a dark brown color. Set beef stock aside. Step 5 In a separate pot, add your rice and water just enough to cover the rice and cook until al dente. Drain your rice into a sieve and run cold water to stop the cooking process. Wash your rice until the water runs clear. Add washed rice into a bowl with a little water in the bottom of the bowl. 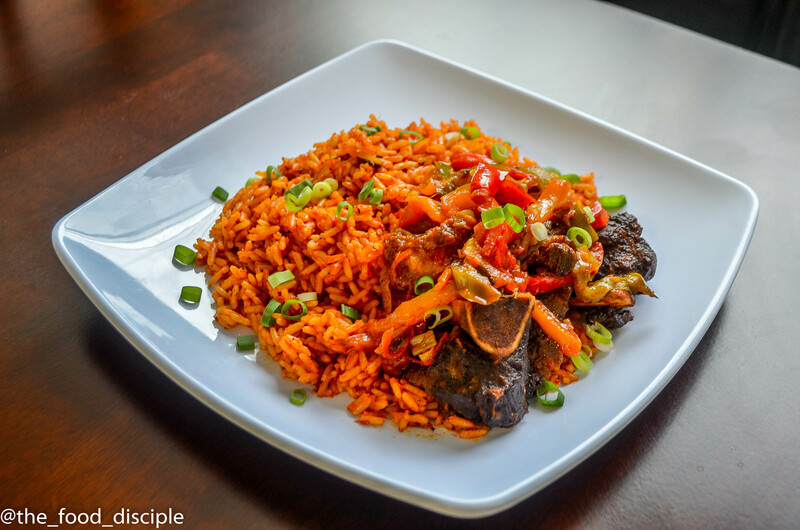 This is will help your rice from becoming soggy when you cook it. Step 6 To prepare your stew, add 4- 5 tbsp of vegetable oil on medium high heat. Once oil is hot, add your blended pepper mixture and fry until it is not sour anymore and mixture has completely reduced in size. Remember to stir so it does not stick to the pot or burn. Reduce heat to medium low, add beef stock and cook for 2-3 minutes. PS: set ¼ cup of beef stock on the side. Add 1 tbsp of curry, 1 tbsp of Italian Seasoning, 2 Seasoning cubes, 1 tsp of black pepper, Fresh Nutmeg, Bay leaves (3-4) and Salt. Stir stew and bring to a boil for 5-7 minutes until all ingredients marry together. Add salt according to preference. Step 8 the steam from the pot will do the cooking. Once rice is tender, stir with a fork or wooden spoon, taste and adjust seasoning if needed (only salt or seasoning cubes at this point). This next step is optional but recommended, add sliced onion and tomatoes. 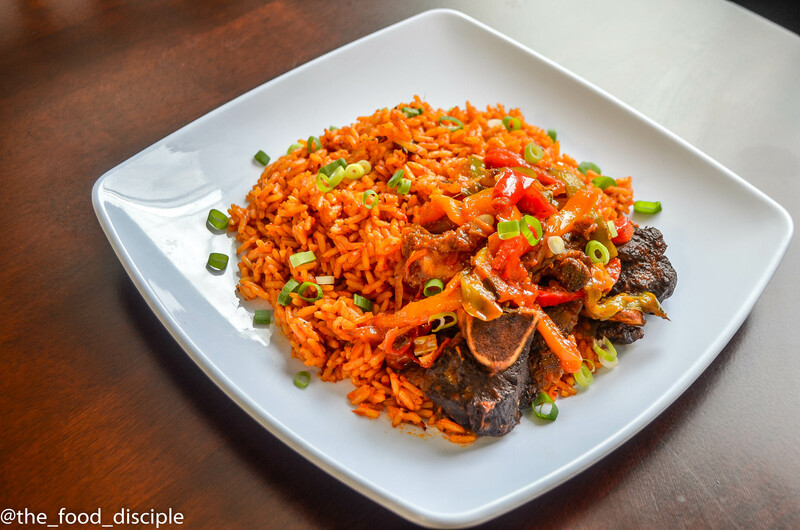 That is the conventional topping for jollof rice but I prefer sliced onion, diced carrot and green bell pepper. Stir and steam for 4-5 minutes. Your rice is ready. Step 9 To prepare peppered beef,in a separate pot add 3 tbsp of vegetable oil. Once oil is hot, add onion, scallions and scotch bonnet pepper. Fry until translucent and then add 2 tbsp of tomato paste, fry until tomato paste it is not sour anymore. Add 1/4 cup of beef stock, curry, thyme cook for 2-4 minutes. Add your beef, bell peppers, and adjust seasoning if needed. ( adjust seasoning with only salt and seasoning cubes). Cook for 6-8 minutes on medium low heat. Step 10 Your food is ready!!! PS: If you do not like hot food, you can always reduce the amount of scotch bonnet used or you can take out the seeds.